I left at the crack of dawn the very next day for Madison, so I couldn’t post about this before: last Wednesday Shaylih Muehlmann gave a reading from her new book, When I wear my alligator boots: Narco-culture in the US-Mexico borderlands (University of California Press, 2014) at the Peter Wall Institute for Advanced Studies (where she was an Early Career Scholar last year). Her reading was beautifully judged – a series of exquisitely written (and read) extracts that re-traced the narrative arc of the book, explained her own take on ethnography (and its writing), and sparked a lively discussion. Thanks to Gaston Gordillo‘s generosity, I was able to devour the book on the flight to Madison; since I had to get up at 3 a.m., that was no mean feat and speaks volumes about the book. 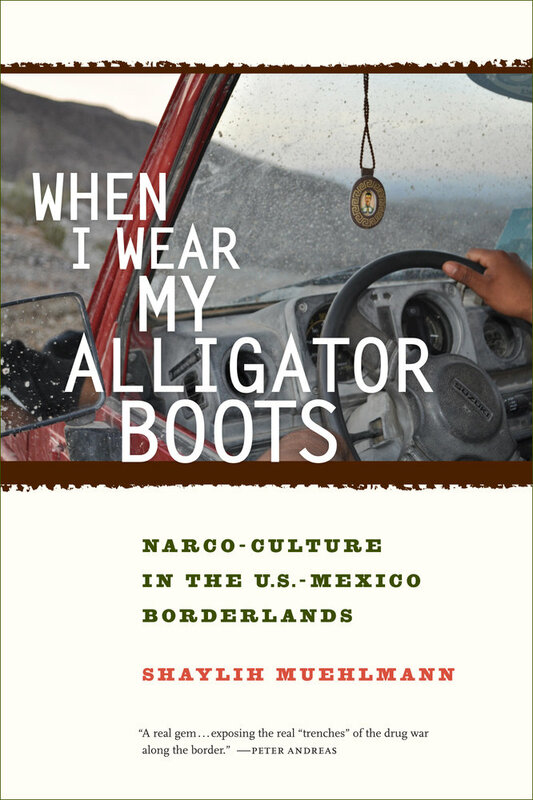 When I Wear My Alligator Boots examines how the lives of dispossessed men and women are affected by the rise of narcotrafficking along the U.S.-Mexico border. In particular, the book explores a crucial tension at the heart of the “war on drugs”: despite the violence and suffering brought on by drug cartels, for the rural poor in Mexico’s north, narcotrafficking offers one of the few paths to upward mobility and is a powerful source of cultural meanings and local prestige. In the borderlands, traces of the drug trade are everywhere: from gang violence in cities to drug addiction in rural villages, from the vibrant folklore popularized in the narco-corridos of Norteña music to the icon of Jesús Malverde, the “patron saint” of narcos, tucked beneath the shirts of local people. In When I Wear My Alligator Boots, the author explores the everyday reality of the drug trade by living alongside its low-level workers, who live at the edges of the violence generated by the militarization of the war on drugs. Rather than telling the story of the powerful cartel leaders, the book focuses on the women who occasionally make their sandwiches, the low-level businessmen who launder their money, the addicts who consume their products, the mules who carry their money and drugs across borders, and the men and women who serve out prison sentences when their bosses’ operations go awry. Read it to find out much more about the intersections between popular culture, the ‘drug wars’ , and the borderlands than the usual cartel-talk. A central theme of the book is not so much the narco-corridors snaking across the border as the narco-corridos, folk-ballads telling stories of the men and women who work the drug business. These are also the subject of Shaul Shwarz‘s prize-winning documentary Narcocultura (2013); I’ve embedded the trailer below, and you find out more here and read a thoughtful review here. 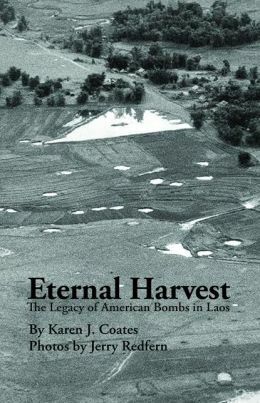 Many readers will know the remarkable work that’s been done to reconstruct the US bombing of Cambodia during the ‘Vietnam’ War: I’m thinking of Taylor Owen and Ben Kiernan‘s ‘Bombs over Cambodia’ which appeared in The Walrus in 2006: available here and here. 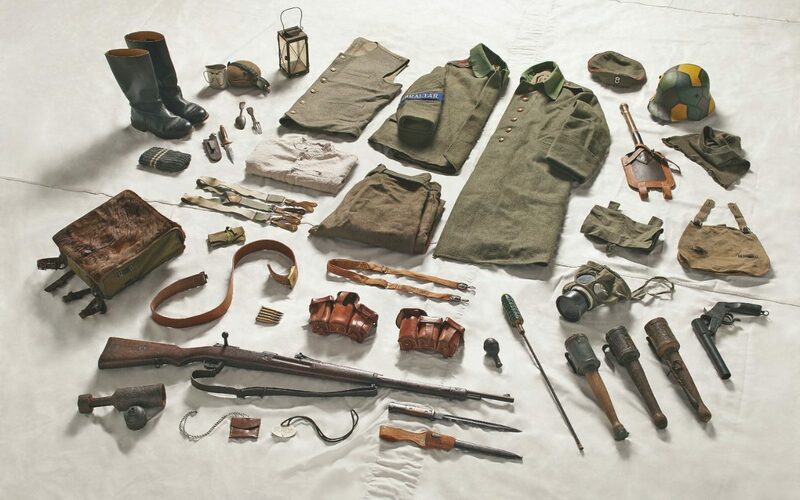 The still-incomplete database (it has several “dark” periods) reveals that from October 4, 1965, to August 15, 1973, the United States dropped far more ordnance on Cambodia than was previously believed: 2,756,941 tons’ worth, dropped in 230,516 sorties on 113,716 sites. 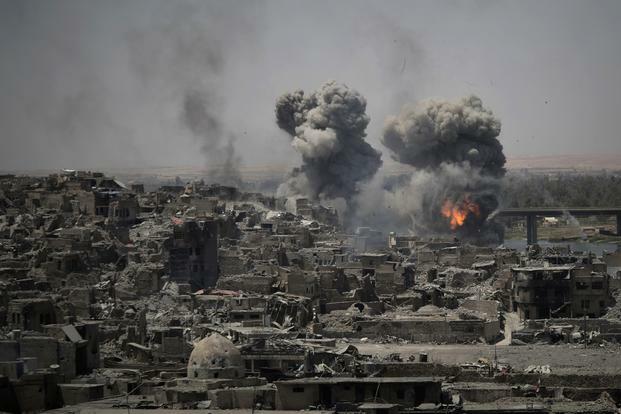 Just over 10 percent of this bombing was indiscriminate, with 3,580 of the sites listed as having “unknown” targets and another 8,238 sites having no target listed at all. 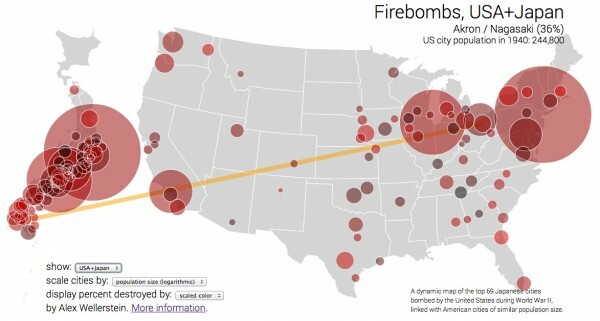 The database also shows that the bombing began four years earlier than is widely believed—not under Nixon, but under Lyndon Johnson. The impact of this bombing, the subject of much debate for the past three decades, is now clearer than ever. Civilian casualties in Cambodia drove an enraged populace into the arms of an insurgency that had enjoyed relatively little support until the bombing began, setting in motion the expansion of the Vietnam War deeper into Cambodia, a coup d’état in 1970, the rapid rise of the Khmer Rouge, and ultimately the Cambodian genocide. The contemporary significance of these air strikes includes, of course, what Rob Nixon calls the ‘slow violence’ of the unexploded ordnance that still haunts the Cambodian landscape today. But they also have implications for recent bombing campaigns in Afghanistan, as Ben and Taylor discuss in ‘Roots of U.S. Troubles in Afghanistan: Civilian Bombing Casualties and the Cambodian Precedent’ here, and for today’s cross-border (though rather less covert) drone strikes in Pakistan, as Henry Grabar argued last year in The Atlantic here. The nearly 600,000 bombing runs delivered a staggering amount of explosives: The equivalent of a planeload of bombs every eight minutes for nine years, or a ton of bombs for every person in the country—more than what American planes unloaded on Germany and Japan combined during World War II. Laos remains, per capita, the most heavily bombed country on earth. 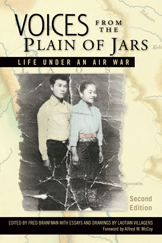 This video shows the US Air Force bombing campaign in Laos, from 1965 to 1973. The data comes from the website of the National Regulatory Authority of Lao PDR (NRA), which oversees UXO clearance in that country. They received the data from the US Embassy in Vientiane in 2000, from records originally created by the Department of Defense and stored at the National Archives. 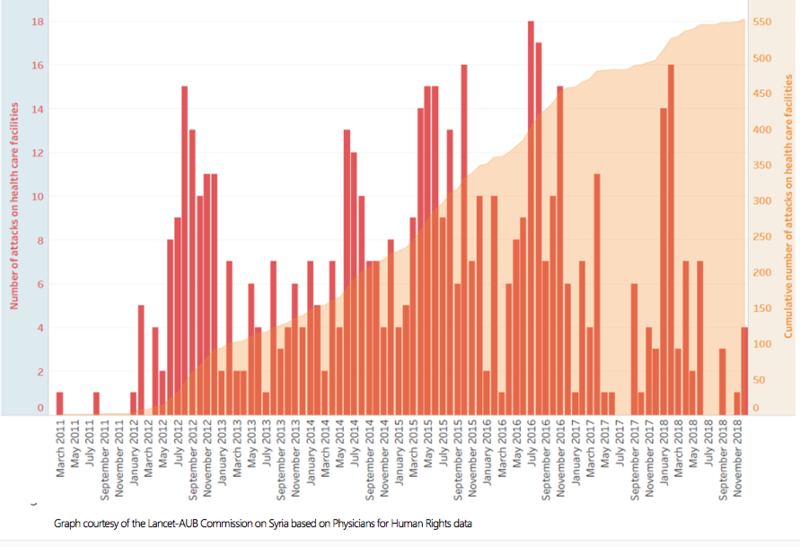 The NRA data sets include information on the number and types of aircraft flown, types of bombs dropped, target conditions and after-action reports. For this graphic, only the dates, latitude and longitude, and the number of bombs dropped per mission are used. The US Air Force began bombing Laos in June 1964. Many branches of the US, Thai, Lao, South Vietnamese and other forces also conducted aerial missions. But this graphic reflects only bombing missions noted in the NRA data, which show US Air Force missions beginning on October 1, 1965. There’s much more information, plus photographs from the book, at the website that accompanies the book. 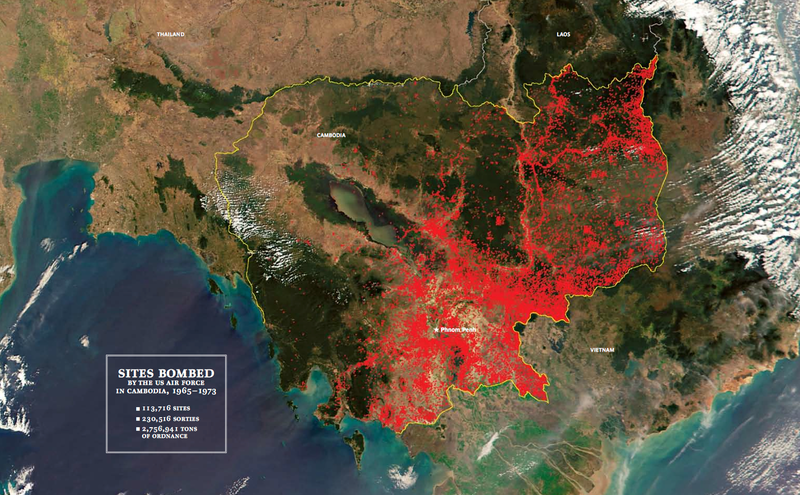 If you want a quick overview of the geography of bombing Laos, Peter Larson also has a useful survey which includes some helpful maps here; he’s constructed his own animation here. ‘Animation’ is hardly the verb for such appalling carnage, I realise; the classic English-language account giving voices to the survivors (and victims) is Fred Branfman‘s brilliant Voices from the Plain of Jars: life under an air war, first published in 1972 and republished last year with an introduction by Alfred McCoy and available as an e-book. 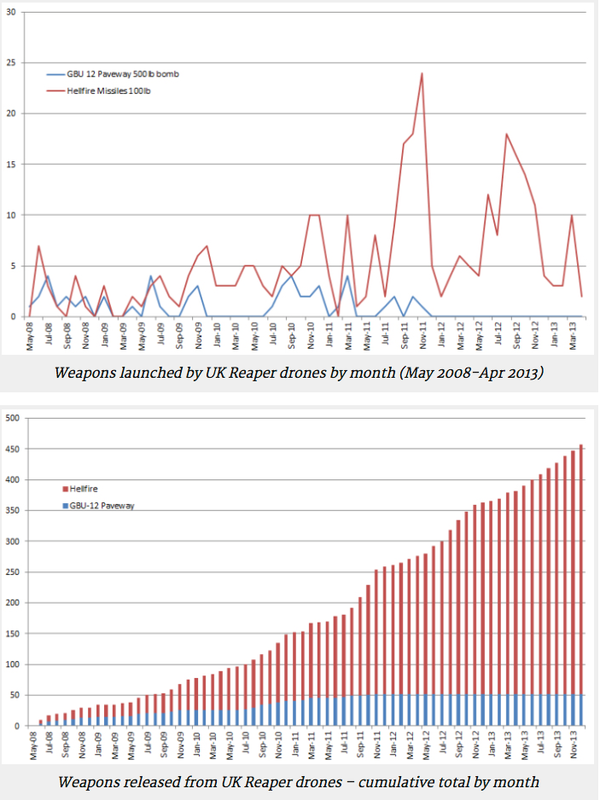 As Craig Jones has discussed in detail, it’s been much easier to get information about the ways in which the United States has incorporated drones into its military and paramilitary operations than to prise open the door of UK operations (see also Chris Cole on ‘five basic facts we are simply not allowed to know here). 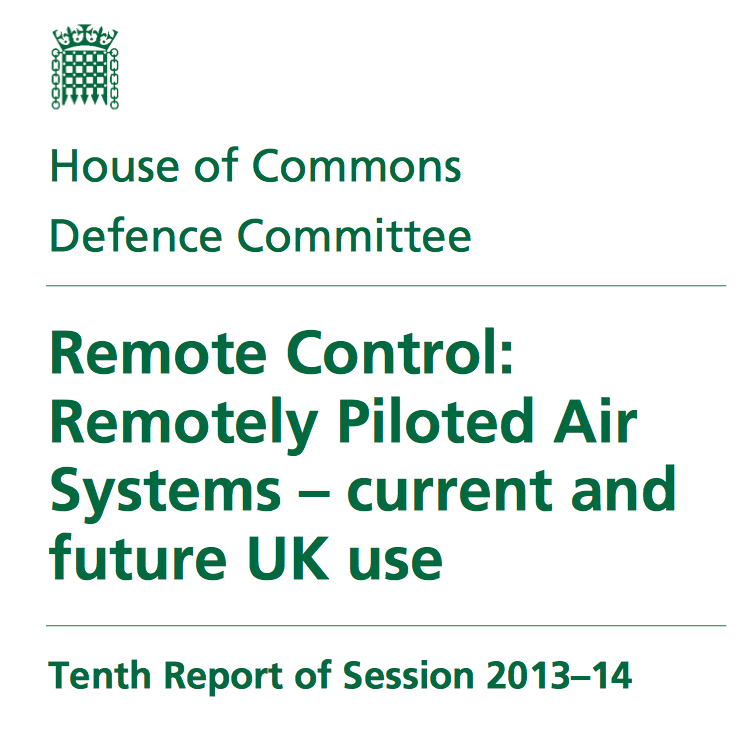 But the House of Commons Defence Committee has just published a two-volume report, Remote Control: remotely piloted air systems – current and future UK use. Volume 1, the report and formal minutes (58 pp), can be downloaded as a pdf here, and Volume II, written evidence (130 pp), is available here. The second volume includes submissions from the Ministry of Defence, Northrop Grumman, and General Atomics together with critical submissions from Drone Wars UK, Reprieve, the Network for Social Change’s Remote Control project, and the Bureau of Investigative Journalism. 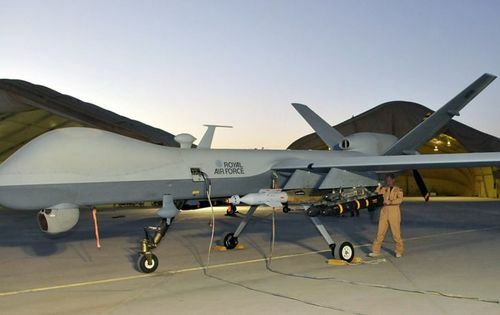 Over at the Bureau, Alice Ross has a first response and summary here, while Chris Cole has a trenchant critique at Drone Wars UK here. I’m still working my way through all this, but here are some key passages. Again, as I’ve argued elsewhere, that ‘sense of connection’ is much more highly developed in relation to troops on the ground than to others who are in (or beyond) the field of view, and who are inevitably shut out from audio or online communications, which in part accounts for the risk to non-combatants whenever troops are ‘in contact’ with the Taliban and other fighters. ‘We consider that it is of vital importance that a clear distinction be drawn between the actions of UK Armed Forces operating remotely piloted air systems in Afghanistan and those of other States elsewhere… In Afghanistan UAS provide intelligence in support of our ground commanders, enabling them to stay one step ahead of the enemy. Whether for targeting the Taliban or supporting troops on patrol, their ability to loiter over and survey areas for enemy activity and then feed back images and video in real time means they are an invaluable asset to our forces on the ground. Together, the UK’s fleet of UAS have carried out over 160,000 hours of ISR operations. ‘It is entirely compliant with International Humanitarian Law. Targets are always positively identified as legitimate military objectives and both pattern of life assessment and collateral damage estimate conducted. Strikes are carried out in accordance with the Law of Armed Conflict. ‘Personnel were keen for the public to know more and understand better what it is they do and to dispel some myths that have grown up about Reaper operations in particular. One pilot commented that the public needed to know that remotely piloted aircraft are “not robots, they’re not autonomous and we spend an awful lot of time training to fly them”. This training emphasised all aspects of the RAF rules of engagement such as whether a strike is necessary, whether any civilians are nearby, and what instructions have been received from the ground commander. 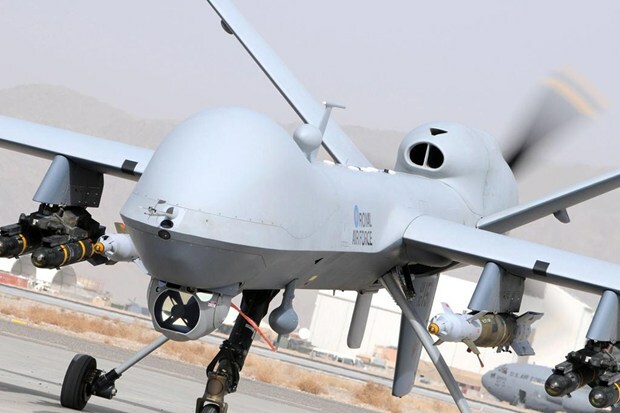 Reaper aircrew were firmly of the view that the loiter time of remotely piloted aircraft allowed more informed decisions to be made and consequently the risk of civilian casualties was reduced should a missile strike be required…. ‘On 25 March 2011 [three years ago to the day!] an attack on two pick-up trucks resulted in the destruction of a significant quantity of explosives and the death of two insurgents. Sadly, four Afghanistan civilians were also killed. In line with current ISAF procedures, an ISAF investigation was conducted to establish if any lessons could be learned or if any errors in operational procedures could be identified. In that case, the report concluded that the actions of the Reaper crew had been in accordance with extant procedures and rules of engagement. For a good discussion of the UK’s definition of ‘civilian’ in such cases, see Dapo Akande at the European Journal of International Law here. It directly emerged from “The Body in Pain,” which has a first chapter on torture and a second on war. I was trying to address the question why when people prohibit torture they make it an absolute prohibition, but when they make a prohibition on war, they always make exceptions. I realized that nuclear weapons much more approximate the condition of torture than of war. Torture involves zero consent on the part of the injured, whereas conventional war allows many levels of consent. With nuclear weapons, there’s zero consent. 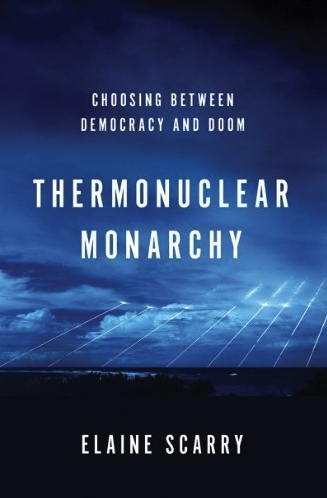 There is an excellent, wide-ranging conversation between Scarry and Sarah Gerard at The American Reader here that goes back as far as Hobbes (who turns out to be crucial for Scarry’s argument) and spools forward to today’s drone wars. If you read just one thing this week, read that. Captives are paraded around gleaming kitchens on leashes, combat troops stalk in living rooms, while beyond the drapes fires flicker, a grieving woman slumps on the deck, and an Army patrol files by. 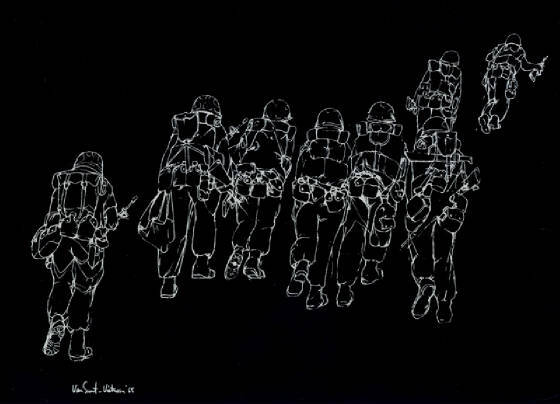 Domestic critics have frequently noted the interchange between security regimes inside and outside the United States; they insist that the ‘war on terror’ ruptures the divide between inside and outside, and draw attention to its impact not only ‘there’ but also ‘here’. But Rosler’s sharper point is to goad her audience beyond what sometimes trembles on the edge of a critical narcissism (‘we are vulnerable too’) to recognise how often ‘our’ wars violate ‘their’ space: her work compels us to see that what she makes seem so shocking in ‘our’ space is all too terrifyingly normal in ‘theirs’. 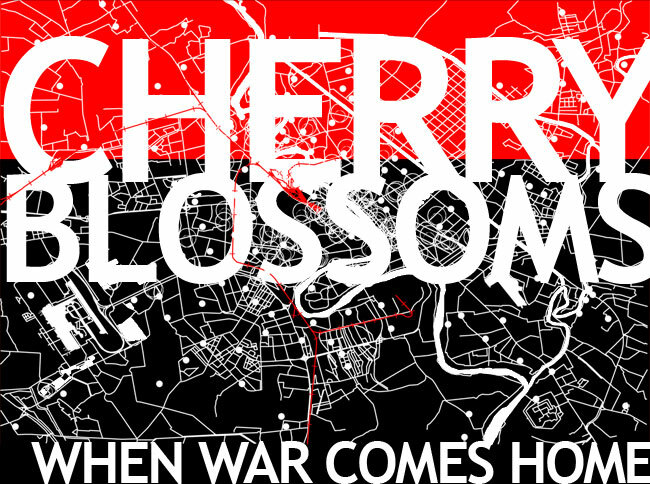 Several projects made cartographic transpositions or mash-ups: superimposing the bombing of Baghdad on San Francisco (Paula Levine‘s Shadows from another place) or Boston (Alyssa Wright‘s Cherry Blossoms), for example, or choreographing a situationist tour of Baghdad in Brooklyn. I’ve been more hesitant about these interventions; I know that these three projects were linked to – and in the last case depended on – ground performances, and I know too that it’s possible to undo the abstractness of conventional cartography, to turn it against itself (here I’m thinking of elin o’Hara slavick‘s brilliant Bomb after bomb). 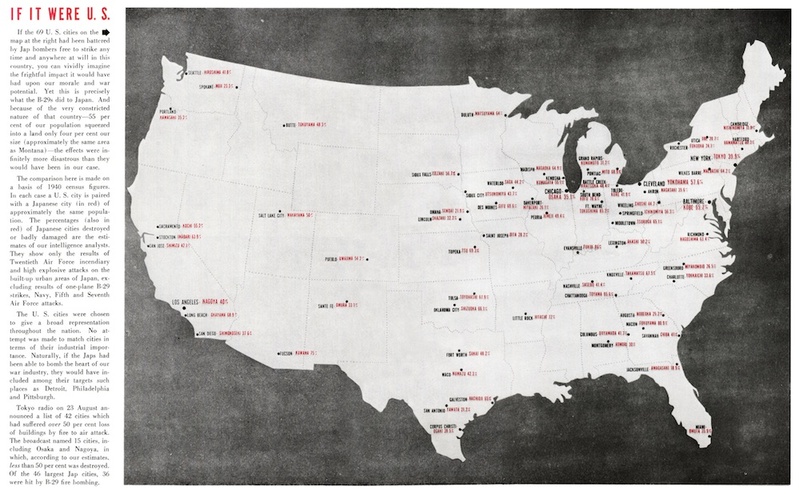 I’ve now seen a different cartographic transposition that dramatizes the firebombing of Japan during the Second World War by juxtaposing a map of the United States with a map of Japan. 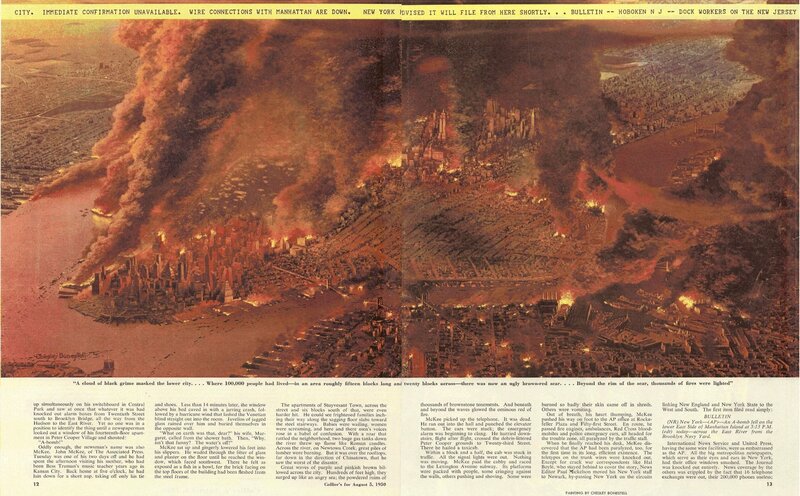 Almost as soon as the war was over there were several visualizations of a nuclear attack on US cities. The image below comes from Collier’s Magazine in 1950, for a cover story called ‘Hiroshima, USA’; you can access the original here and read more here. But projects like these still deflect the critical gaze from the horror of what happened there to the horror of what might happen here. Indeed, that was precisely the point, as Joseph Masco shows in his brilliant essay, ‘”Survival is Your Business”: Engineering ruins and affect in nuclear America’, Cultural Anthropology 23:2 (2008) 361-98; reprinted in Ann Laura Stoler (ed), Imperial debris: on ruins and ruination (Duke, 2013). The problem is redoubled in the case of Hiroshima and Nagasaki, because those two hideous mushroom clouds have so often blocked our view of the firebombing of Japanese cities that preceded the two nuclear attacks. Here the work of David Fedman and Cary Karacas on bombing Japan is indispensable, not least for its illuminating discussion of the central role of cartography (see Cary’s bilingual historical archive here). 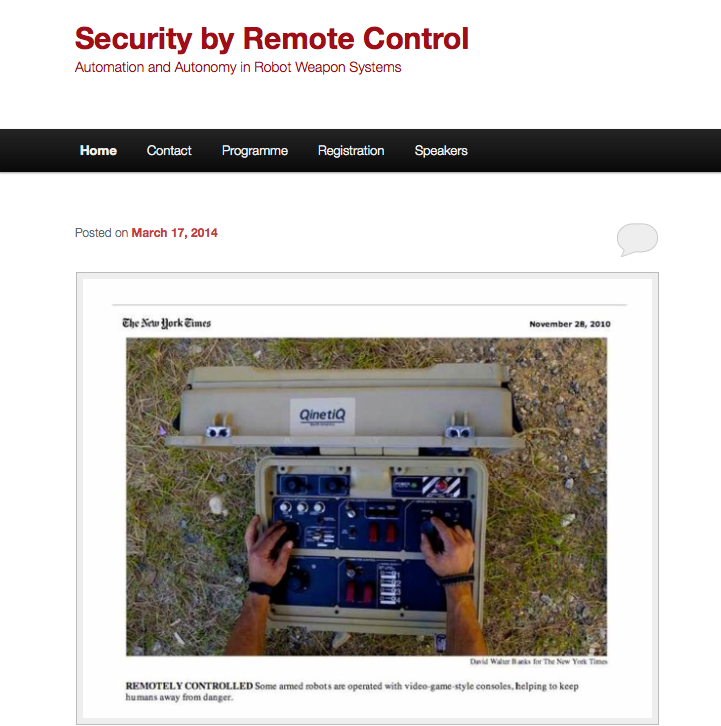 News from Lucy Suchman that the website for the Security by Remote Control conference at Lancaster, 22-23 May, is now live here. It will be enhanced and updated as the symposium approaches – including programme details: I’m still thinking over what I might present – but registration is open now. Despite investment in new technologies, the legitimacy and efficacy of actions taken in the name of security is increasingly in question. In April of 2013 a coalition led by Human Rights Watch initiated a campaign in favour of a legally binding prohibition on the development, production and use of fully autonomous weapon systems. Simultaneously, some military and robotics experts argue that equipping robots with the capacity to make ethical judgments is an achievable technological goal. Within these debates, the ‘human in the loop’ is posited alternately as the safeguard against illegitimate killing, or its source. Implicit across the debate is the premise of a moment of decision in which judgements of identification and appropriate response are made. This symposium will focus on on the troubling space between automation and autonomy, to understand more deeply their intimate relations, and the inherent contradictions that conjoin them. The purpose is to teach human rights activists or journalists how to conduct their own forensic architectural investigations. For example, the highest resolution satellite imagery comes from private American companies that cost $1,000 per image, which Weizman says is relatively affordable since an analysis would usually require just two: one right before the strike and one after. There are certainly limitations to the data they obtain, however. With satellite imagery, for example, even the highest resolution images degrade to a pixel that translates to 50 cm by 50 cm of actual terrain. 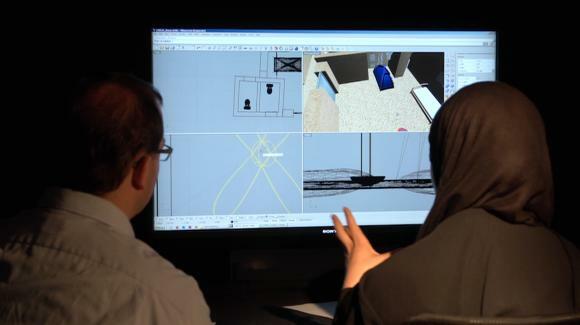 This means that a drone could easily hide undetected in one of those pixels, says Weizman…. [It] also hides the damage caused by drone strikes. When asked if this an uncanny coincidence, Weizman explains, that while there is prerogative for states and militaries to maintain an advantage, that pixel is also proportioned to hide a human and the private companies issuing such data are cognizant of privacy issues. Even so, this allows countries to deny drone strikes, says Weizman, because drones are beyond the threshold of detectability in the available satellite imagery. And while I’m on the subject of architecture, the Guardian reports that on 19 March the Royal Institute of British Architects called for the suspension of the Israeli Association of United Architects from the International Union of Architects for its complicity in the construction of illegal settlements in occupied Palestine: what Israel consistently calls ‘the facts on the ground‘. And those dismal ‘facts‘ aren’t hiding in the pixels.